According to the Building Engineering Services Association (BESA), offsite construction currently accounts for at least 3% to 4% of the UK construction sector. However, the cost and time savings and quality control benefits associated with this method will no doubt see it grow exponentially in the next decade. For example, CIBSE estimate that on average a 13.4% cost saving can be achieved when prefabricating compared to conventional onsite builds. This has been recognised by government who announced in the 2017 Budget that it will be favouring offsite construction for all publicly funded construction projects from 2019. It has also recently been highlighted by the House of Lords Committee on Science and Technology as key to meeting construction targets. One of the main drivers behind the offsite trend is the lack of skilled workforce across the sector, which looks set to become more of a problem with Brexit. The FMB’s most recent State of Trade report revealed that shortage of construction workers has reached its worst-ever levels, and an additional 230,000 workers will be needed over the next five years to meet current targets. Offsite construction means that buildings can be constructed up to 30% more quickly than using other methods, and in some cases can reduce costs by more than 25%. This could offer a solution to construction industry shortages, because if projects can be completed more quickly, capacity will increase. These benefits can also be applied in building services to commercial heating plant and there are a number of different modular solutions available, from packaged plant rooms and energy centres to pre-assembled modules and rigs. With sustainability becoming a key focus for the industry, more renewable solutions are being manufactured offsite. With the emerging trend of heat networks (also known as district heating) in residential and commercial buildings, packaged plant rooms and HIU utility cupboards can help achieve efficiency targets as well as save space and cut installation time. Heat networks currently provide about 2% of the overall UK heat demand across the domestic, public, industrial and commercial sectors, but a much higher share can be achieved. The government has identified heat networks as a key technology to decarbonise heat and has allocated £320m of funding out to 2021 to grow the heat networks market. Government’s research suggests that 14% to 20% of the UK heat demand could be cost-effectively met by heat networks by 2030 and 43% by 2050. In addition, Scotland has set an ambitious target to connect 40,000 homes to heat networks by 2020, representing 1.5TWh of Scotland’s heat demand. 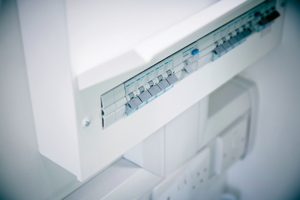 Heat networks see traditional residential boilers replaced with large scale plant rooms and heat interface units (HIUs) to connection of the district heating network to the building’s heating system and feed individual properties. The challenge for specifiers and developers is trying to balance supplying all the modern utilities a resident would need with the amount of space allocated to each property. The UK has the smallest homes by floor area in Europe; the average newly built home here is just 76m2 compared to 137m2 in Denmark. What’s more, the Royal Institute of British Architects (RIBA) has warned that more than half of new apartments are being built to a scale too small for families to live in, describing them as “tiny, rabbithutch new-builds”. This is where prefabricated solutions can help. 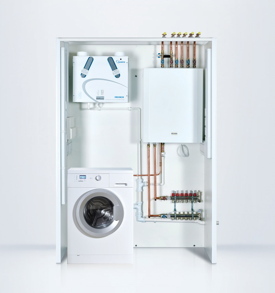 Tailored to suit a building’s requirements, utility cupboards come fitted with HVAC products such as HIUs, comfort cooling units, underfloor heating capability with associated piping and electricals installed, as well as washing machine space. They can be configured to suit the layout, service connections and spatial requirements of each project. Units can be assembled in the factory and delivered as a ‘plug and play’ solution. This minimises on-site disruption and enables, faster easier installation, meaning that no installation specialists are required on site. In fact, according to CIBSE, installation time can be reduced by up to 64% when compared with onsite construction. Health and safety is also improved due to reduced activity taking place on site. There’s also an understood improvement in quality, accuracy and efficiency with factory production. Units can be built to an approved design and spec and are pre-tested and commissioned in-house, thereby reducing the level of risk for all parties. With traditional construction projects, specs can change as the build progresses, however, by defining the design collectively before the offsite build, specifiers and contractors can be assured that the exact specification will be met. Offsite construction is seeing a surge, driven by property demand, skills shortages, and environmental considerations. In response to this and with residential space at a premium, specifiers and contractors should look to prefabricated heating solutions that can boost efficiency whilst minimising costs for all parties.